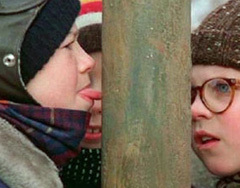 It was a scene right out of the seasonal favorite " A Christmas Story ," at Prospect Elementary School in Lake Mills Thursday morning, as police were called after a 10 year old boy got his tongue stuck on cold metal. "A bus driver found a kid with his tongue on the bar of a gate going into the school," said Lake Mills Police Chief Kathleen Hanson. "We just took some warm water and got his tongue unstuck," said Hanson, adding that they don&apos;t get many such calls. Hanson said the boy&apos;s mom, a nurse, had a talk with him. "He is never going to do it again," she said. And yes, just like the character Flick in " A Christmas Story ," the Lake Mills student was back in class after getting unstuck.